The isotope dilution mass spectrometry (IDMS) technique is well known and widely reported in the literature. However, its application can present considerable difficulties with regard to obtaining reliable results. Produced jointly by the Royal Society of Chemistry's Analytical Methods Committee and the Valid Analytical Measurement (VAM) programme, the aim of this book is to provide a simplified yet robust methodology, together with adequate guidance, to enable laboratories wishing to use the technique to obtain reliable data. The methodologies, for inorganic and organic mass spectrometry, which use exact and approximate matching, are illustrated with worked examples and clear diagrammatic representations. A comprehensive glossary of terms, references to key publications and an extensive IDMS bibliography are also provided. 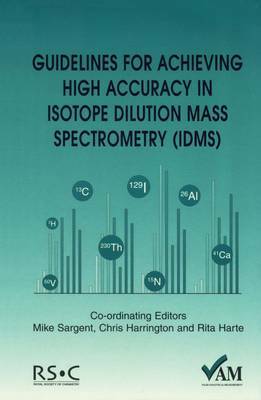 Clear and comprehensive in coverage, Guidelines for Achieving High Accuracy in Isotope Dilution Mass Spectrometry (IDMS) will provide valuable assistance to a wide variety of analytical chemists interested in applying the IDMS technique to their own measurement applications.